State/OIG on US Embassy Denmark: "Ambassador has, in effect, become a first-line supervisor"
The Office of the Inspector General conducted an inspection of US Embassy Denmark in Washington, DC, between September 1 and 29, 2010, and in Copenhagen, Denmark, between September 30 and October 14, 2010. The Ambassador also has fostered a high degree of collaboration among the various agencies at the embassy. The reporting, analysis, and outreach functions are operating below potential, due to the concentration of decision making in the hands of the Ambassador. The embassy staff perceives that the Ambassador is unwilling to delegate authority, and that this weakens the chain of command and disempowers section leaders, making it difficult for them to organize their work and to hold officers within their sections accountable. The embassy has been consumed with a series of resource-intensive, one-off events: two presidential visits during the last quarter of 2009 and an ambitious international conference it is cosponsoring in fall 2010. A small management section has adopted some of the Department’s newest innovations, delivering high quality services in most areas. Some general services operations, however, suffer from inexperienced leadership and a lack of staff training. Increasing tourism, climate change, commercial opportunities, and the prospect of future independence will call for increased embassy attention to Greenland, currently an autonomous country within the Kingdom of Denmark. The public affairs section runs an active and efficient public diplomacy program that is well adapted to the Danish environment, but it should make several administrative improvements, particularly involving grants. The Ambassador should engage in more policy-oriented press activities as part of a long-term media strategy. Denmark is the only Nordic country that is a member of both the North Atlantic Treaty Organization and the European Union, and its international engagement has reflected interests that are convergent with those of the United States. 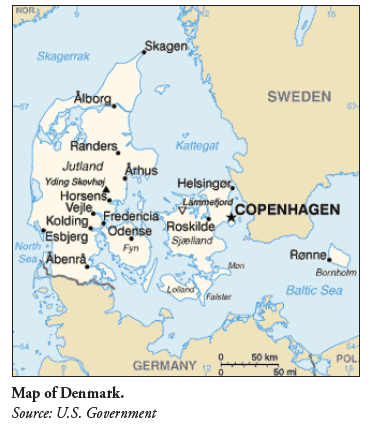 The Danes value the United States as a close ally, and twice welcomed President Obama during 2009. At its peak, Denmark had some 540 troops in Iraq; it has a current deployment ceiling of 750 troops in Afghanistan (Helmand province), in addition to peacekeepers in Kosovo and Lebanon. Denmark will chair the Arctic Council until April 2011, the UN climate change process until December 2010, and the European Union in 2012. The Ambassador arrived at the embassy as soon as she could, pressed for time to present her credentials to prepare for several high-level visits planned for fall 2009. As a result, she did not conduct all of the consultations in Washington that ambassadors normally conduct in advance of assuming charge. This situation left her less than fully prepared for the work she had to undertake immediately upon her arrival. During that same transfer season, the embassy experienced a heavy turnover of personnel. Besides the Ambassador, the turnover included four of five political/economic officers, all three consular officers, the regional affairs chief, and the Defense attaché. The deputy of the political/economic section left a vacancy in his position when he took a 1-year assignment in Afghanistan. Continuity at the embassy further suffered when the Ambassador, after conferring with and receiving guidance from the Department, asked the former DCM to leave the embassy in January 2010. This departure resulted in a staffing gap of the DCM position for 9 months, which the political/economic section chief filled on an acting basis. There followed extended gaps in both the management officer and regional security officer (RSO) positions as well. The section has been challenged to meet this agenda. The absence of the deputy section chief on a 1-year tour to Afghanistan has meant that the section has lacked the capacity to complete some of its planned reporting. In addition, two presidential visits, turnover in senior staff, and preparations for a large, U.S. cosponsored conference have diverted a large share of the remaining resources from core reporting. The consequent press of business has led officers to develop some of their reports with little and often no face-to-face interaction with Danish officials, relying instead on material from the press and the Internet. This is only nominally responsive to the embassy’s reporting responsibilities. The Ambassador is deeply involved in all aspects of reporting and approves all substantive cables, regardless of whether the DCM has reviewed and cleared them. Her editorial intervention is frequent and substantial, and an excessively rigorous clearance process has resulted in some delays in filing cables. Even in the case of routine démarche cables, the section must prepare a package for the Ambassador’s approval that includes background to the issue, talking points, and recommenda­tions for the action officer and the démarche recipient. Once the officer has deliv­ered the démarche, the section produces a reporting cable package. In this way a routine function has become a time-consuming and staff-intensive activity, often significantly delaying the démarche process. In recent months, the Ambassador has agreed to receive only information copies of packages for the most routine démarches, rather than holding them for approval. While this is a positive step, it only partially addresses the time delay issue, and does not reduce the burden on staff. A similar document preparation protocol is in place for other reporting cables. The GSO has been battered by huge turnover in staff in the last 2 years, the addition of several new positions to support increased American staffing, and unusually heavy requirements for high-level visitor support in the past several months. President Obama visited twice, while the First Lady, Secretary of State, nearly 50 congressional delegations, and other high-level U.S. officials attended a major summit on the UN climate change process. The impact of those factors left the GSO staff feeling weary and underappreciated.